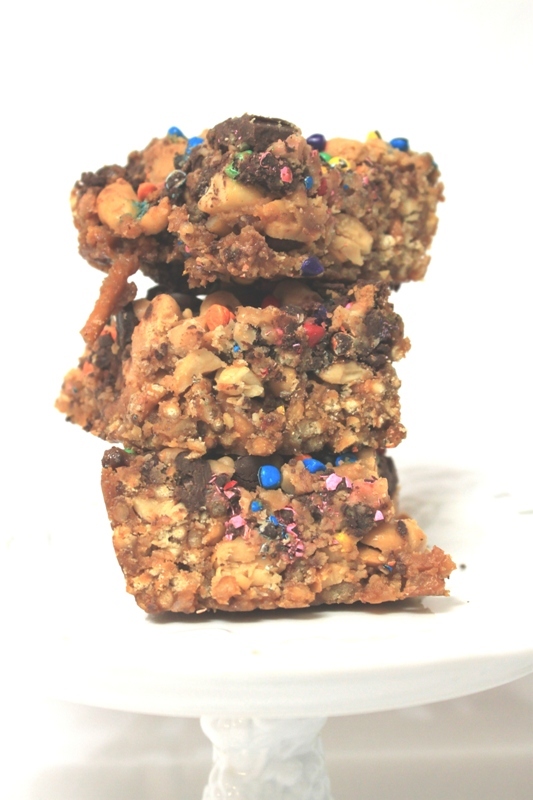 Bits o’ Everything Bars | Rosetta Bakes! Here’s another great recipe if you like sweet and salty treats. This recipe is easy to make, no baking required! You do have to melt the caramels, but that’s about the hardest part. These are like eating a really nutty salty chocolaty candy bar! I will definitely make these again. These are from the magazine “Better Homes and Garden’s – Brownies and Bars 2014.” These really captured my attention because in the picture (magazine photo) they look so ooey and gooey…and ohhhhh so yummy! 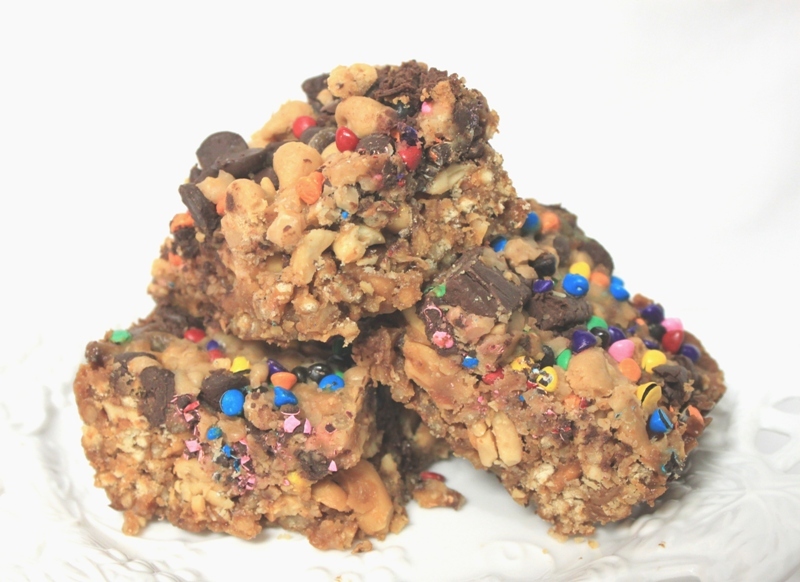 Peanuts, chocolate, caramel and then…..oatmeal! How can you go wrong with all these delicious ingredients? So, I did. What happened is that I did not crush my pretzels small enough. The topping wanted to come off from the bottom pretzel part, and that my friend is how they did not seem to adhere to the bottom of the crushed pretzels. I know know it’s because I didn’t crush them well enough. Next time making these I’ll be sure to crush the bottom layers so they will absorb the caramel better. I hope you enjoy the dessert/candy bar/brownie! Happy Bits o’ Everything Bars! 1. Preheat oven to 325F. Line a 13 x 9 x 2 inch baking pain with foil. Grease foil; set pan aside. For crust, in a medium bowl stir together crushed pretzels and granulated sugar. Stir in the 1 cup melted butter until combined. Press mixture evenly into the bottom of the prepared baking pan. 2. In a medium saucepan, combine the 1/2 cup butter, the whipping cream and brown sugar. Cook and stir over medium-low heat until butter is melted and brown sugar is dissolved. Stir in caramel bits. Cook and stir until caramel is melted and mixture is smooth. Stir in peanuts. 3. Quickly pour caramel mixture over rust, spreading evenly. 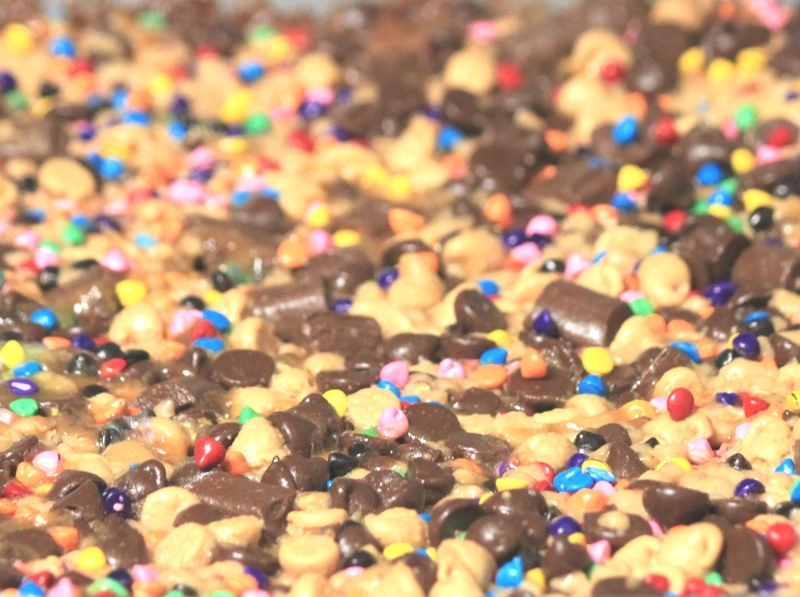 Sprinkle with dark chocolate pieces, mil chocolate pieces, peanut butter-flavor pieces and toffee bits. 4. Bake about 25 minutes or until edges are bubbly and light brown. Cool in pan on a wire rack. Using the edges of the foil, lift uncut bars out of pan. Cut into bars.